(1). 1 main compartment, 2 slip pockets and 1 interior zip pocket.(2). An back pocket can hold a lot of items like your iPhone 7. (1). Magnetic Front Pocket: it can be a quick access to your essential items! We choose HIGH DENSITY oxford nylon fabric as material, STRENGTHEN every stitching joints and WIDEN the strap to 0.6" in width to make it durable for years. This is absolutely a much more excellent quality bag than other bags in same style and same price on amazon. Zipper top closure. This tote can accommodate 13" laptops, folders, A4 files, books, iPad, cosmetics, cellphone, charger, water bottle, wallet, lunch box and more. 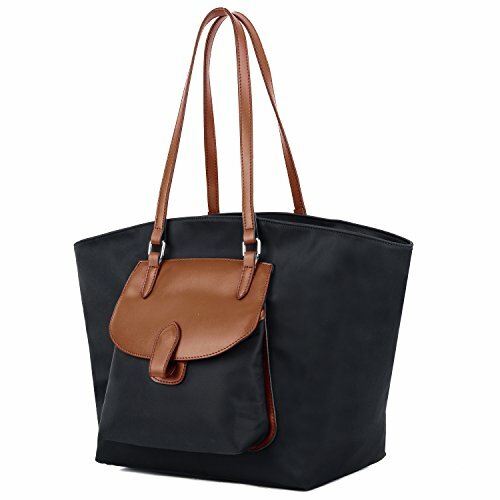 This tote has an Front Magnetic zipped pocket for keys/ 5.5"smartphones. The inside has a big compartment with 2 open pockets and a zipped pocket. Handle drop is 9.45", easy to wear on your shoulder. Lightweight and pliable, a great carry-all for work, travel, school or leisure. Only 1.4 pounds. Dimensions: 10.63"(Bottom Length) x 11.61"(Height) x 6.89"(Bottom Width).